New service: Soft powdery hombre brows! $375 al a carte or just $200 with microblade brow procedure. All clients who have enjoyed microblade brows also can enjoy powder brows for $200. What is Microstroking (Microblading)? Please visit www.ScottsdaleHead.com for more info on Scalp Micropigmentation – the newest alternative to balding and thinning hair lines. Although microblading originated in Asia, it has quickly made its way to the west coast in the US…and Scottsdale, Arizona! Microstroking gives brows a clean crisp punctuated definition to the face. No smearing, no smudging, no powdered-on brows. This permanent cosmetics procedure can last for 1.5 years. This service is NOT a block of color tattooed in the shape of an eyebrow stencil, rather this is very detailed work where brow design and hair strokes are done by hand. The results are immediate and fabulous! As with lashes, imagine waking up every day with perfect brows! Although it seems to be the latest fad, microstroking is here to stay. Microstroking (microblading) offers very defined hair strokes that stay crisp, post healing. The hair strokes are created by a microstroking artist, using a hand held tool. The brows are created by hand. The tool used to design the brows offers a very small, pointed, flexible surgical needle. These needles allow for even more definition and precision in the brow line. Helena Rubenstein, beauty matriarch (what Coco Chanel is to be haute couture), Miss Helena herself is a trailblazer, founding mother, pioneer in the cosmetics industry once said “There are no ugly women, just lazy women.” Indeed, “smart beauty” is the basic foundation at ItGirl Diva Studio. Go ahead and sleep in an extra 20 minutes each day or prance around at coffee shop before work since you have lush lashes and brows applied, you’re not lazy at all! You have more time for living AND your lashes and brows are on “fleek”. Smart beauty. The results are medium high to stunningly gorgeous. Be prepared to bow to the brows on your face and enjoy the best microblading service in Scottsdale. Already have previous brow tattoo? Please call to notify Sherene so that proper materials and enough time are booked in case color correction/lifting of previous tattoo is needed. Please DO NOT BOOK APPOINTMENT if you are only seeking a consultation. NEW SERVICES! This is not a drill! Soft flowing see through powdery brows. This service can be done WITH microblade boss brows procedure! The effect is soft, natural and oh so complimentary to microblade hairstrokes. The healed result is a powdery translucent effect in the brows on top of the crisp defined hairstrokes. The perfect fix to bring symmetry back to brows. How is this done? A different hand held tool with a group of needles is used to implant a near sheer pigment into the dermis. Soft powdery brows are NOT the typical opaque solidly colored in brows, but rather translucent coloring in brows. Very soft and still very committal as are the hairstrokes and lasts approximately 12 – 18 months. It’s very likely you will have to break up with your brow powder/gel/pencil/palmade as a result. Soft powdery brows is ideal as a crowning finishing touch to microblade brows but also is great as a stand alone service for to brows too. Soft powdery brows is to microblade what salt is to pepper, what yin is to yang, what French is to vanilla, what ice cream is to cake. . . they all are famous timeless couples that just go together. Sultry eyelash enhancement is rich black pigment deposited into lash line rendering a thick dense lush lash look at the base of lashes. 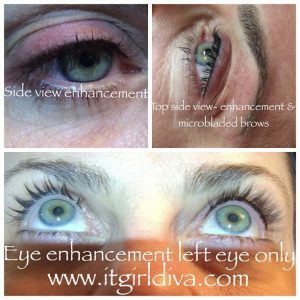 This is a permanent make up procedure and highly beneficial for those looking to cut down their mirror time as eyes are more defined and ready to go with your spirit to live the life you love! Before and after pictures posted on instagram. Sultry eye enhancement is NOT your typical mother’s thick eyeliner tattoo! This service is recommended for those who may want to only wear lash extensions seasonally or not at all or simply take a break, enjoy a no make up au naturel routine. Sultry eye enhancement is a one time service (touch up at 30 days recommended for “fine tuning”) all you have to do is say “I do” to your lash base being married off to the skillfully applied permanent black onyx. Eyes will appear more vibrant! While looking down there is no visibility of black pigment as this is tapped into the lash line using a hand held tool much like the microblading service, which by the way is another perfect brow compliment. To prepare for this service you must: wear no makeup, no lash extensions (lash extensions can be reapplied after 2 weeks), drink no caffeine, lie still and expect to walk out of ItGirl Diva studio with visible results. Same aftercare as microblading procedure applies to sultry eye enhancement. Please call 602.680.0008 for more details. What is scalp micropigmentation? Please visit www.ScottsdaleHead.com for more info on newest service – an ideal alternative to thinning and balding hair lines.